The CLUE model simulates future land use changes such as deforestation, land degradation, urbanization, and land abandonment. 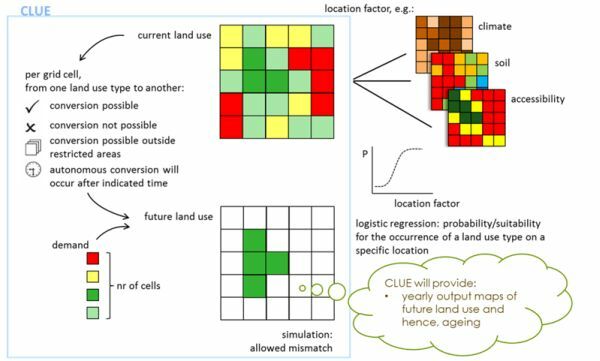 The CLUE model enables a spatially explicit, multi-scale, quantitative description of land cover through the determination and quantification of physical and human drivers of agricultural land use. The maps show where specific land use choices may be successful and how governmental steering policies may work out. The location preference for the different land use types is based on the spatial variation of the location factors that were hypothesized to be important determinants of the land cover pattern. 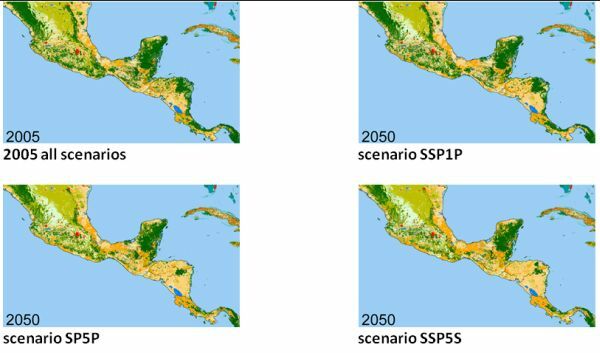 Results of the analysis of drivers are incorporated into a dynamic model, which describes potential changes in the different land cover types in the area over the simulated time horizon. CLUE output is given in the form of a time series of land use maps. 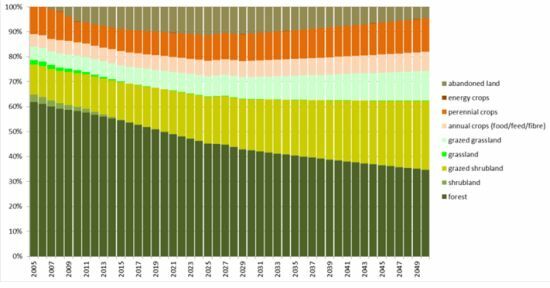 Changes in land use can be seen from the maps (visually: amount of change, location of change). The amount of change per land use type per spatial area (e.g. country) between time steps can be given as a percentage in relation to the original (e.g. current; 2005) land use map. The suitability for allocation is calculated as the sum of a number of values (spatial maps) that reflect the determinants of the total suitability. The main determinant of the total suitability is the current location preference in response to the location characteristics such as soil, slope, climate and accessibility of markets. These preferences can be estimated based on expert knowledge or by econometric models. Econometric models can be based on current or historic conditions. It is possible to update this location suitability by scenario specific decision rules that reflect changes in land allocation decisions, e.g. reflecting a more rational or more sustainable land allocation. Complex tool requiring hired expertise of Alterra. A new version of CLUE was developed in a ongoing current FP7 project (van Eupen et al,. 2014). Demo version of the previous version of CLUE-s is available here.